frankiestyle101 | Let's discover your style! A picture of my client’s closet. This is what your wardrobe can look like when it’s filled with 80% of your favorite pieces. Talk about a “closet of work” several years in the making. One thing I love about shopping with clients are finding items that allow them to see themselves in a new way. I feel so blessed to be part of a client’s journey of transformation. Here’s a throwback of a Shopping Appointment with my client Mara and what we found along the way. Sometimes I have new clients who say they wear mostly black and white but would like to try color. I encourage them to take a baby step outside their comfort zone and elevate their neutral palette by considering navy, cream and even army green. A small difference can really brighten your look! 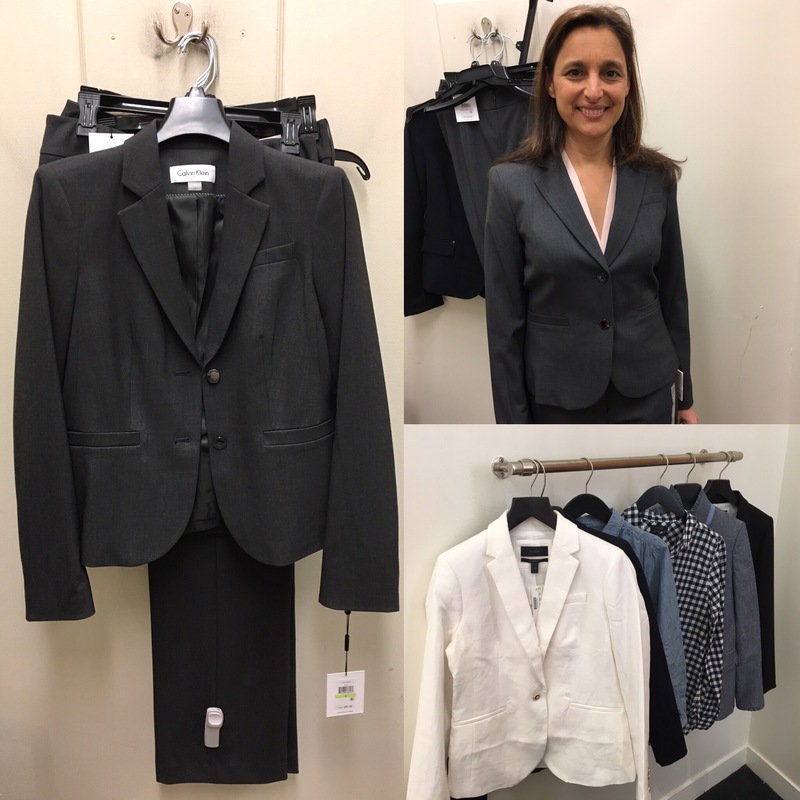 Here’s another collage of pics from shopping for suits with my client Mona. When in doubt, Calvin Klein & JCrew has great suit separates that work well together. I’m back blogging!! This post has taken forever for me to finish. Lol! 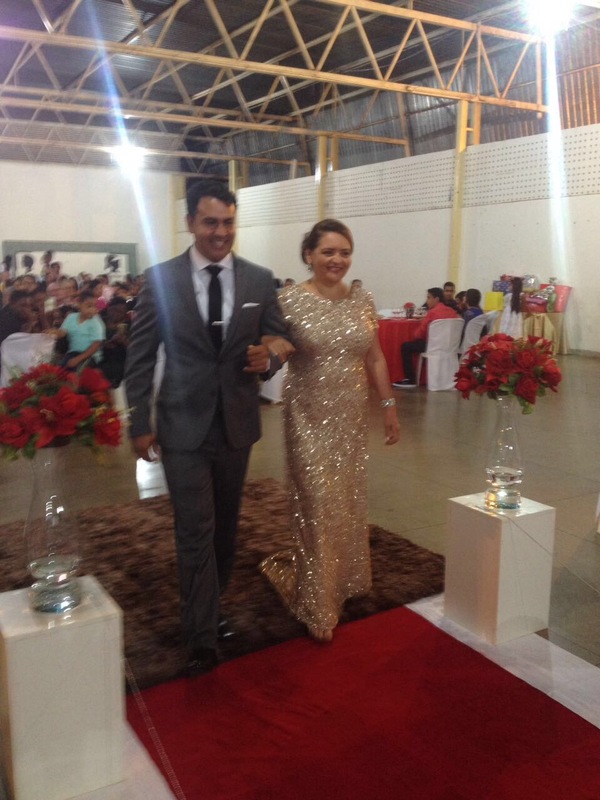 Here are pics from my client Luzia’s brother’s wedding in Brazil last summer. I was tasked with helping her find the perfect gown, one that wouldn’t outshine the bride’s but enough to make a statement. Luzia is the big sister of the groom (Edimar at left) and was responsible for walking him down the aisle. We decided to go with this beautiful sequined gown by Adrianna Papell (found at Nordstrom.com). Luzia then accessorized with Banana Republic jewelry from her own wedding. I usually don’t style men, but Luzia asked me what Edimar should wear. It wasn’t a traditional American wedding so everyone’s formalwear didn’t have to match a chosen color palette. I suggested what I think every man looks great in – a dark gray or charcoal suit. Paired with a white shirt, black tie, silver tie clip, and white handkerchief, this tailored outfit makes almost every man look put together. 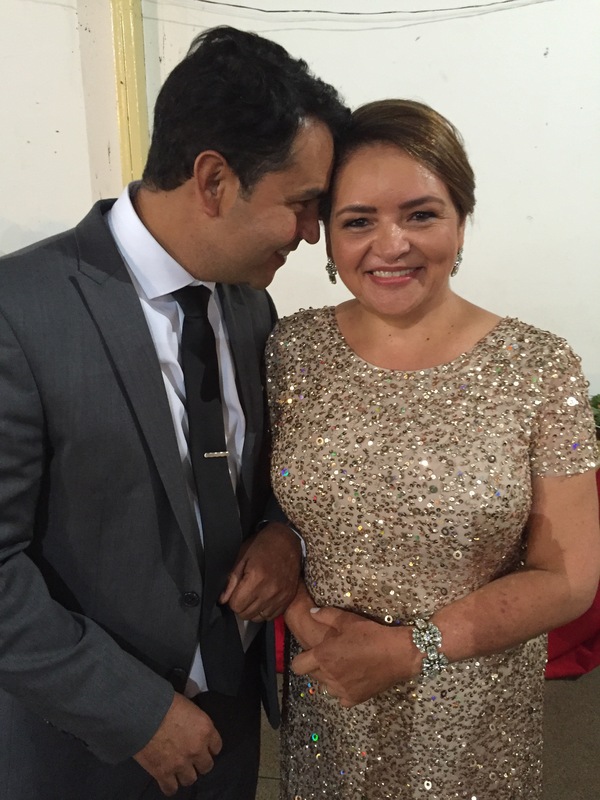 I really enjoyed styling Luzia for Edimar’s wedding. She looked gorgeous and more importantly looks like she felt that way too. My client Luzia treated her friend Rocio to a Shopping Appointment with me for her birthday. Rocio never buys clothes for herself and when she does, she tends to buy items in black or neutrals. Instantly I knew that this was going to be a trip where we would look for prints and colorful items that would pair nicely with her existing neutral pieces. 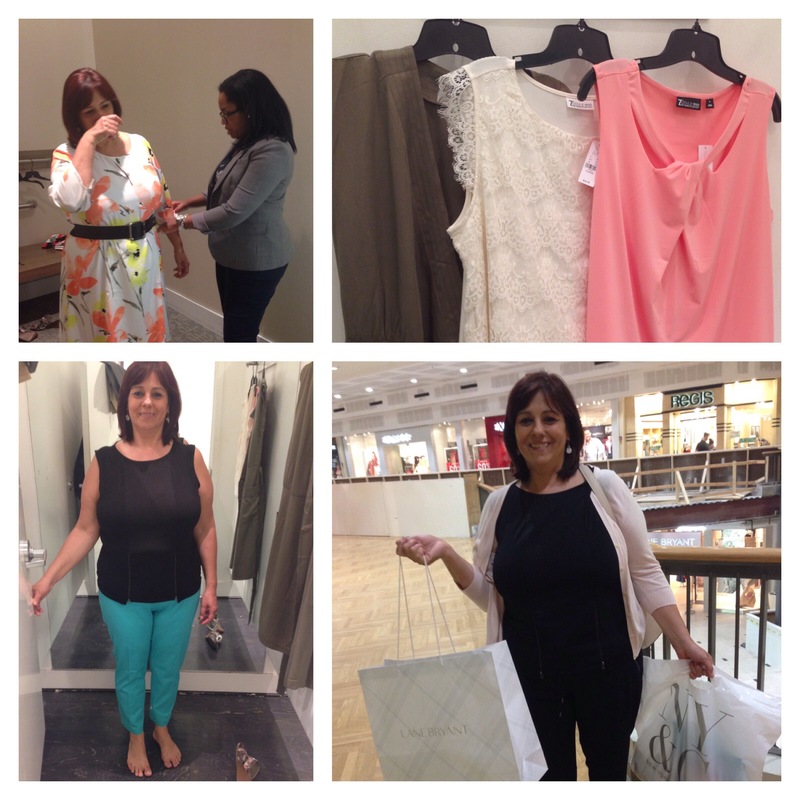 After introductions and a few questions about her current lifestyle, we started shopping at Lane Bryant. Rocio has plus-sized curves so I wanted to shop in a store that had a variety of styles made just for her. 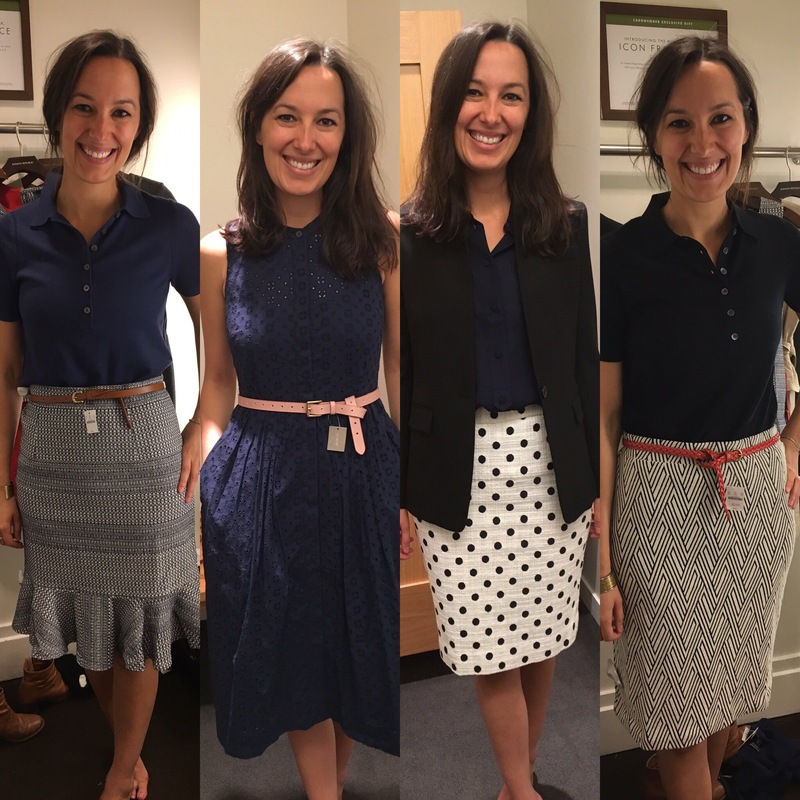 While trying on the clothes we selected, I encouraged her to be fitted for a bra that would help create a structured foundation to her figure. Wearing the right-sized bra makes such a difference in how your clothes fit! While at Lane Bryant, Rocio purchased an airy white dress with a spring floral print and coordinating black belt. We then went to New York & Company to look for blouses and pants. I find that NY&CO has a great selection of pants that are in a large range of sizes (0-20) and hem lengths (petite, regular and tall). Their ankle pants fit great but the pair Rocio tried on had pockets that tended to gape open. I recommended that Rocio have the pockets of the pants sewn closed so that the pockets won’t gape and interrupt her streamlined silhouette. We settled on a bright turquoise pair of ankle pants and 3 blouses, and a long statement pendant necklace. Rocio left very excited about her purchases and I hope her enthusiasm for her new clothes continues to grow. It is a great feeling leaving a client satisfied with pieces that will help her have more of a starring role in her own life. 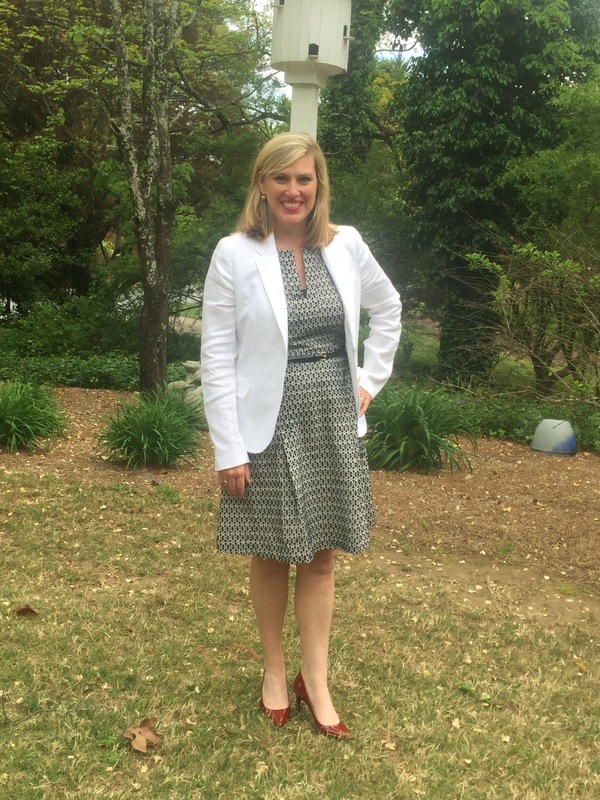 Once again I was excited to have another opportunity to style Meredith – this time for the UGA Alumni Awards luncheon. My inspiration was wanting Meredith’s outfit to be professional but still evoke a spring vibe. I fell in love with a V-neck fit and flare dress from JCREW and thought it would be the perfect focal point for Meredith’s outfit. The dress had a geometric lace overlay in black and white and looked like something Meredith could continue to wear year round. I was pleased that the fit-and-flare dress had a V-neck because they’re not as common as their crew-neck counterparts. For a woman with curves and a larger bust, a V-neck balances the upper body so that the bust doesn’t become the focal point. Because Meredith had to wear red and black, we bought a white linen blazer to lighten the dress and accessorized with a skinny black belt and red patent leather pumps. Meredith was a little unsure of red shoes but I recommended a darker red that wouldn’t be so bold at a business event. Because I’m a UGA alumna and bleed red and black, I really enjoy styling a client in one of my favorite color palettes. I look forward to creating more looks for Meredith in the future!